Interim interventions can bring people together to reimagine their streets. When done right, tactical urbanism is a powerful tool to show what’s possible and test design strategies to make streets safer for everyone. That’s exactly what the City of São Paulo and partner organizations accomplished in the neighborhood zone of Santana. 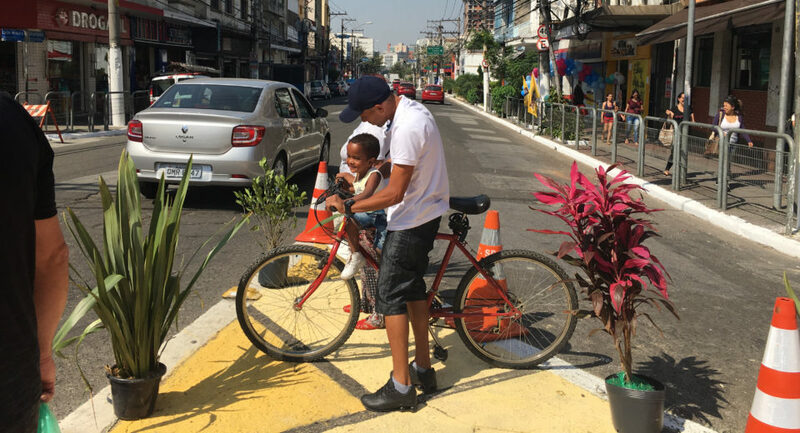 The City of São Paulo has been actively implementing road safety projects and policies since 2011 through programs such as the Life Protection Program, the Pedestrian Protection Program and the Area Calmas. NACTO-GDCI has been working in partnership with Prefeitura de Sao Paulo, CETSP, ITDP Brazil, WRI, Vital Strategies, and Bloomberg Philanthropies to provide technical assistance for Area Calmas (Reduced Speed Areas), a comprehensive program that aims to reduce crashes and improve the safety for pedestrian and cyclists, through implementation of traffic calming strategies. On September 16th, 2017 the Area Calmas team successfully implemented two ‘pop-up’ street transformations in the Santana neighborhood as part of the National Mobility Week and São Paulo Biennale, an experience which underscored the importance of community engagement and metrics collection alongside interim interventions. In an effort to generate new ideas, build community support, and improve local knowledge around road safety, the team conducted multiple community engagement workshops with different stakeholders and age groups prior to the pop-up intervention. Using methodology developed by NACTO-GDCI, each engagement session began with an overview of the current status of road safety and an explanation of the role of street design and different design elements in creating safer streets. Participants were then asked to point out areas in their neighborhood where they felt safe or unsafe, and explain why. Next, they were asked to identify specific challenges and recommend design updates that they would like to see in their neighborhood. Finally, participants were asked to provide feedback on draft designs and were invited to the transformation event, where they shared their thoughts on the changed space. Gathering community input before the implementation helps to improve the design and build local support. 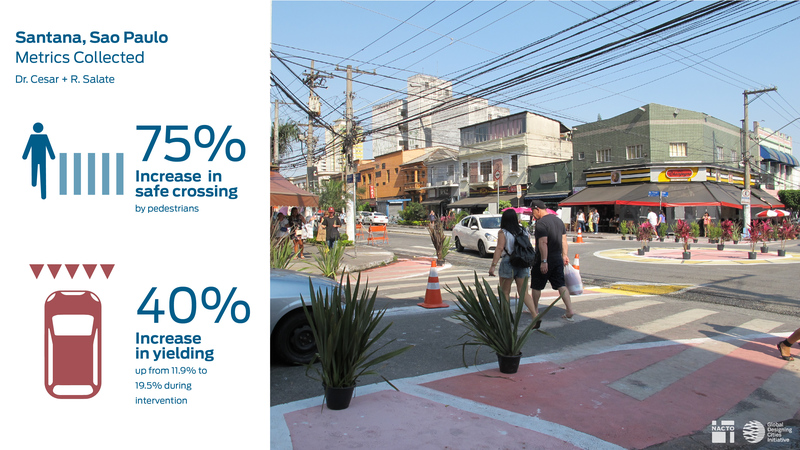 The goal of the Santana transformation was to reduce traffic speeds while safeguarding pedestrians, thus NACTO-GDCI in partnership with FIAM-FAAM collected metrics before and during the pop-up event to measure changes in use and behavior and understand the impact of the intervention. Surveyors qualitatively and quantitatively documented and analyzed the existing urban conditions, including data on pedestrian flow, vehicle volume, signal timing, use of crossings, and user perception of the space, and change in activity. The implementing team assembled in Santana at the break of dawn to start marking, painting, organizing cones, and placing planters to transform 450 sq meters of underutilized space in the roadbed. 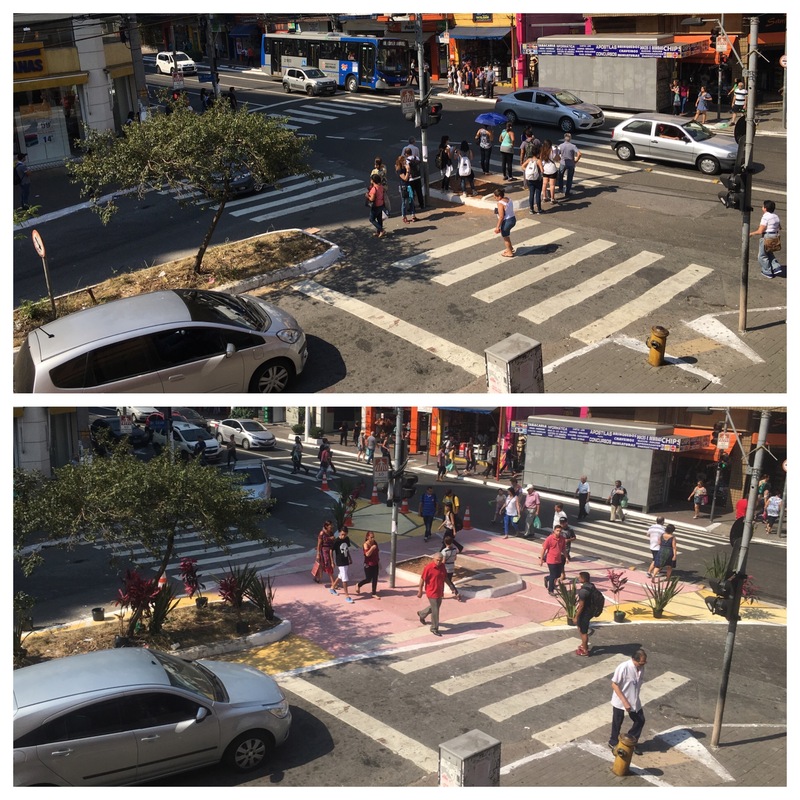 The sites were selected to improve conditions for pedestrians near active commercial streets (R. Voluntários da Pátria, R. Dr. César and R. Leite de Morais). 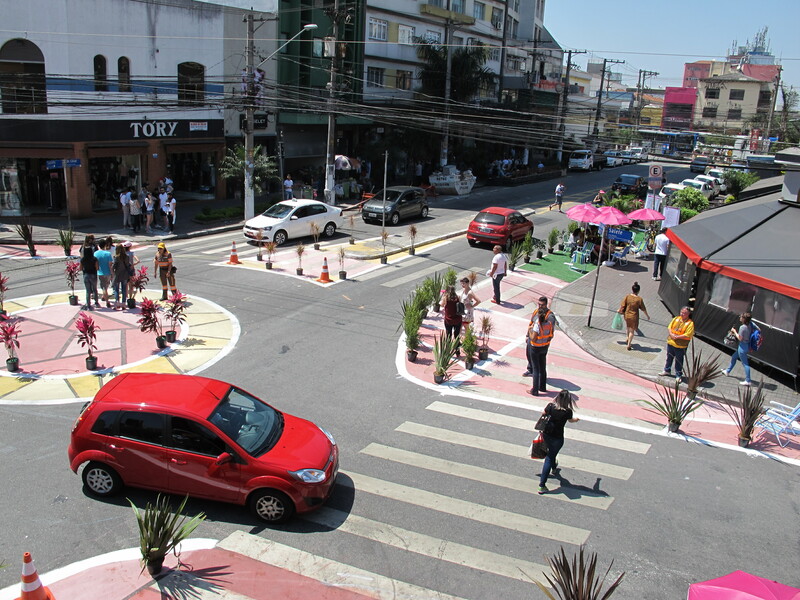 In total, two intersections along Rua Dr. César were transformed, one was calmed by adding a roundabout and curb extensions, while the other by widening a refuge island. These changes helped to channelize and slow turning vehicles. The intersection with the roundabout was made more compact by installing curb extensions, which had the added benefit of creating new public space through the use of planters, outdoor seating and umbrellas for shade. The pop-up intervention succeeded in improving user compliance, reducing turning speeds, and building local support. Data collected on R. Dr. César and R. Salete revealed that there was a 75% decrease in people crossing outside the facility and a 40% increase in cars yielding to pedestrians. 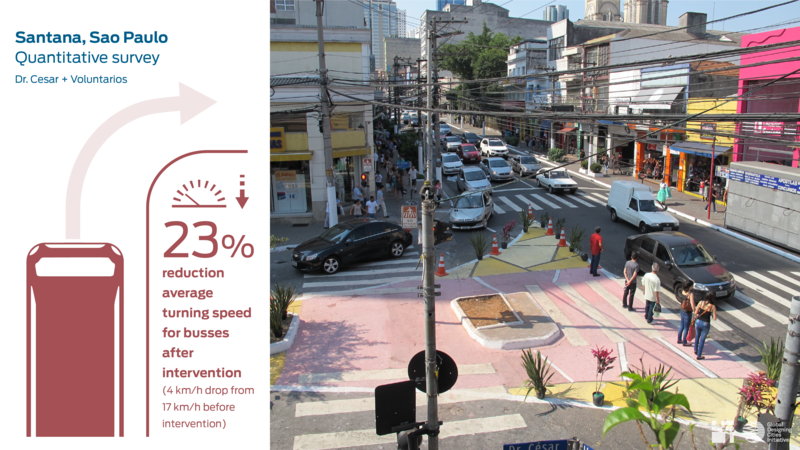 On R. Voluntários da Pátria and R. Dr. César, turning speeds for buses reduced 23% while pedestrians had more than three times as much waiting space, making the intersection safer for people. Local users responded positively—91% of the people interviewed during the intervention liked the new design and 88% want it to be permanent. While the Santana intervention lasted for only a day, it went a long way towards inspiring the Borough Mayor’s team to commit to permanent implementation. The experience allowed designers to test new solutions for two intersections, measure impact, and foster new relationships between city agencies, all while providing the community with a chance to re-imagine streets and see the potential for them to become the heart and soul of their neighborhood. Furthermore, after observing the new geometry, local engineers were inspired to use this example to update the city’s codes on roundabouts, bringing us one step closer to change the state of practice through a designed process. The temporary intervention resulted in increased pedestrian crosswalk compliance, and a decrease in the vehicle turning speeds, among other benefits. Check out a time-lapse video of the transformation, below! 5 Hours to Road Safety V2.0 in Santana, São Paulo from Ankita Chachra on Vimeo.